The cost varies depending on the lock type. Locks can range from £15 up to £250. Call us and give a detailed description of the lock. No we do not charge a call out fee. We have a minimum labour charge which is only charged if the job is completed to your satisfaction. We aim to arrive at all emergency situation between 15mins to 1 hour. However you will be given a more accurate ETA on calling 07947 426 981. A standard rim cylinder (Yale lock) generally doesn’t take longer than 15mins in the worst case scenario. It can however be opened within a matter seconds depending on the quality of the lock. A 5 lever British Standard mortice deadlock is a high security lock and is therefore alot more challenging and will need more time and patience. Yes. To be an MLA member you must be CRB checked. Please ask to see my MLA identification which states that I have been CRB checked. It is advisable that all locks in the premises are changed, as burglars are known to pick up spare keys that they see lying around, that you may have not noticed were missing . 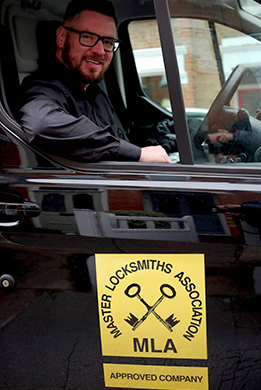 A locksmith will advise on any additional reinforcements to your doors and windows to give you peace of mind that this is unlikely to happen again. We accept cash or credit / debit cards. We do not accept American Express.